Hired guns at the Marathon: Why Such Secrecy about Private Military Contractor's Men Working the Event? 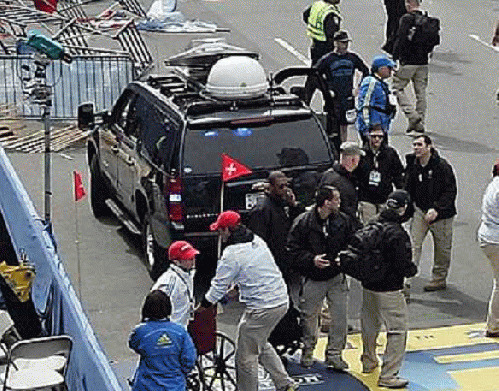 And nobody will talk about those Craft International Services private security personnel who were widely observed and photographed near the finish line of the Boston Marathon, wearing security ear-pieces, hats and T-shirts bearing the company's skull logo, and all wearing the same dark coats, khaki pants and combat boots, some carrying what appear to have been radiation detectors. I first contacted a man identifying himself as Jack Fleming, a public affairs person with the Boston Athletic Assn., sponsor of the marathon. Fleming advised me that "If you want to ask about that you should contact the Commonwealth (of Massachusetts) Executive Office of Public Safety." I called that agency and spoke with the public information office there, a man named Terrell Fleming. He first said, "Did you call the Marathon organizers?" When I replied that I had, and that they had said to call his office, he replied, "They did?" Then he said, "You should call the City of Boston Police Department. They released a security plan to some media organizations." Indeed they had released that plan to the Boston Globe . Based upon the information it got from the police the article the Globe ran , did report that the Police had deployed "air patrols, K9 units, and more than 1,000 uniformed officers and soldiers along the 26-mile course and the finish line," but it made no mention of the private contracting of soldiers-for-hire, which is what Craft International does (see the Craft website ). News agency Reuters reported, meanwhile, that a top official for the Massachusetts state Homeland Security Department, Undersecretary Kurt Schwartz, told a group at Harvard U. that his agency had "planned" for a possible bombing attack on the marathon, even running a "table-top" exercise about such an event a week before the race.